UCLA needs a mercy rule. Yikes, UCLA’s AD might be waiting for Mora in the locker room to fire him at halftime. Beatdown. At halftime Jim Mora should walk into the tunnel and out into the ocean. This is the most embarrassing performance for UCLA football since … ? Texas thinks UCLA is a train wreck. RIP UCLA. RIP Josh Rosen. RIP Jim Mora. UCLA doesn't deserve to play at the Rose Bowl. Send them dudes to San Bernardino City College. Looks like my UCLA friends at work will suddenly not want to talk about college football tomorrow which is a change from last week. Texas A&M leads 38-10, has 281 rushing yards and this will conclude my tweeting for this game. UCLA is just completely overmatched. I was feeling badly about USC football right up until I watched UCLA today. Les Miles? You think Josh Rosen will relax after this loss in his hot tub? I think I've figured out Jim Mora's strategy: 1. Get Rosen Killed, 2. Tank the season, 3. Take Darnold with the No. 1 pick in the draft. Any UCLA fan who stays for the entire game at the Rose Bowl will receive a T-shirt, "Loyal UCLA fan." Many sizes available. UCLA should fly Mora somewhere tonight and fire him on a tarmac in a city other than L.A. just to one-up its rival. Can you imagine being a #Jets or #Bills fan and looking at Rosen right now? It's one game, but yikes. Can't decide if I'm more impressed with how good A&M is or how bad UCLA is. 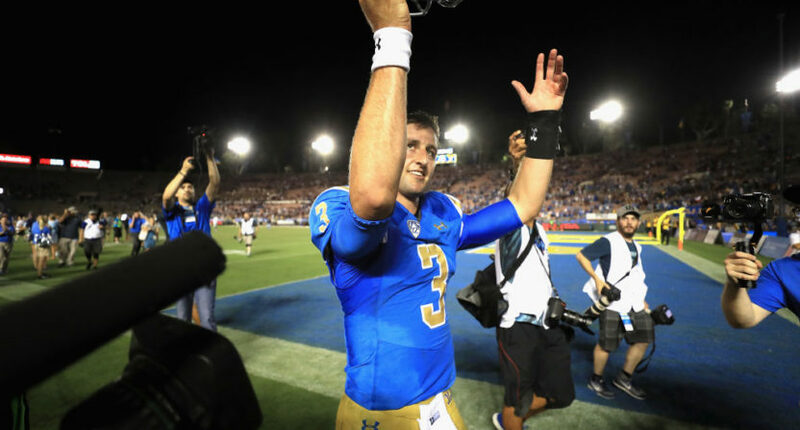 If Josh Rosen just chucked up the deuces on college football right now, would there be any backlash? I doubt it. Josh Rosen will feel right at home with Jets in 2018, this Bruins offensive line is hot garbage. Texas A&M men, UCLA boys. I've had about as much of the #UCLA beatdown I can take. Won't learn anything new about Rosen in this blowout. Since being on the cover of Sports Illustrated & being called "face of college football," UCLA has won 3 games with Josh Rosen as their QB. What number did Icky Woods have at the deli? UCLA looks like a bunch of California boys getting dominated by #TAMU MEN.